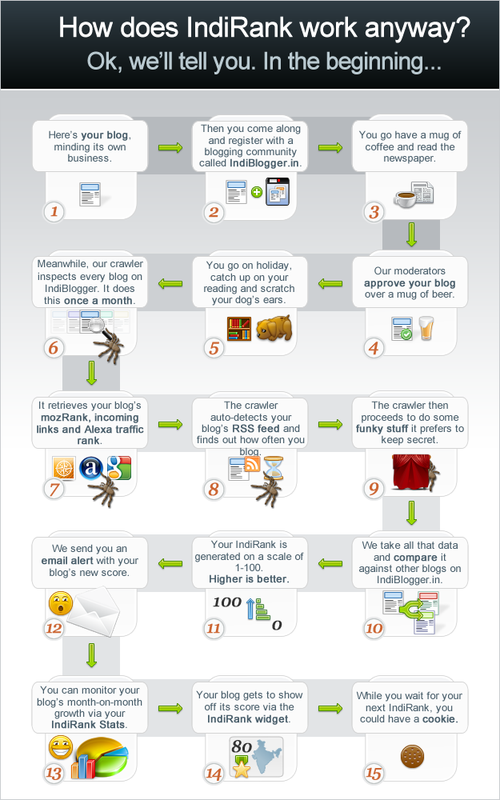 IndiRank is a system we built to rank the blogs in the IndiBlogger network. Although we manually verify every blog before it's allowed into the network, the IndiRank system is completely automated. What does my IndiRank mean? It's like runs in a game of cricket - the higher the score, the higher ranking you have. Blogs are ranked on a scale of 1-100. A blog's IndiRank is calculated based on various factors. Other blog ranking systems rate how popular a blog is. We've taken it a step further based on how deserving a blog is of becoming popular. This is to ensure that the lesser known, but well deserving blogs are pushed up the ladder as well. IndiRank will be completely refreshed every month, so a blog's previous rank will have no bearing on it's present rank. What are the factors which affect IndiRank? We've combined several factors including Google PageRank, Incoming links and alexa ranking (Inspired by the research done by Binaryday). Recently, we added mozRank as an important factor. The system also checks to see the frequency at which a blog is updated, and three other secret ingredients. Some of these factors have more weightage than the rest. Not every blog applies to our algorithm, and a blog may get a rank it does not deserve. The IndiRank algorithm is continually tweaked to improve it's accuracy. No piece of computer code can ever judge your blog as well as your readers can - so get your blog reviewed on our forum if you haven't done so already! If you have any other questions on IndiRank, please check our FAQs or send us a message. A little tip for all you bloggers - don't neglect your blog for too long, and keep blogging!